Reflection Group "Towards a New Solidarity"
From Easter 2013 onwards, in selected weeks, a new reflection group is being offered to those who wish to take part. 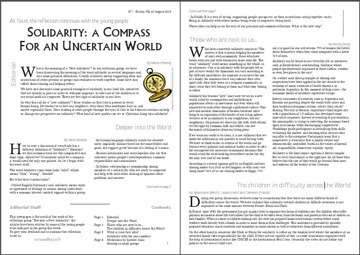 The group will spend time thinking about the ideas put forward by Brother Alois in the Letter 2012-2015 – "Towards a New Solidarity". Those who choose this option attend the Bible introductions in the morning or afternoon, and then participate in the reflection group for the other half of the day. This year, the focus will be on the four "Proposals for 2015" by Brother Alois. The group will lead workshops open to all during the course of the week and also try to find creative ways of recording what they have done. 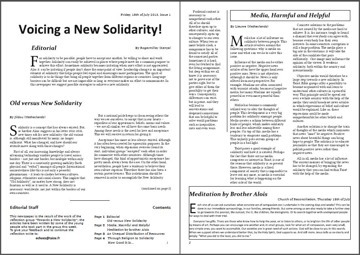 A “participant article” brought together people from different countries around the meaning of the word “solidarity” in different languages. Here it is below. A lot of words many of us do not understand, but they all mean the same thing. The word “Solidarity” comes from the Latin word “solid”. Solid, something that stands firm and strong, like the soil. A solid ground on which a little seed can grow and become a majestic tree with the most beautiful flowers and fruits. So could Solidarity be a ground on which all of humanity will grow as a seed God has planted in the garden of life? By watering this growing plant, protecting it and taking care of it a big tree will grow. A tree bearing fruits of love, trust and unity. The most beautiful flowers will blossom in all different colors, religions, cultures and languages. In the Chinese language the word Solidarity is divided into four different words and meanings which say that a group will bond and melt together by sharing and will become a communion. In some languages there is also a saying that we are all branches which makes us a part of one big tree. Indeed this is also used in the New Testament when St. Paul tells about Christians being parts of the whole Body of Christ. But if a branch is diseased it will not be able to bear fruit; this could also affect the other branches and in the end the whole tree. That is why the Russian dictionaries speak about Solidarity as people’s interdependency. Humanity is not able to survive without one another. Living in an absolute unity which is the German explanation for Solidarity. Being one. Also in the black South African culture there is a short but very powerful word “Ubuntu” meaning “I am because we are”. In Malagasy language, solidarity means “Firaisan-kina” or “Fifanampiana” or “Fifampitsinjovana”. It means that you should try to help one another, and to take care of the others in different ways. How can we be happy and carefree while others all over the world are suffering and dying? Could Solidarity be the way out of all this suffering and let the diseased branches of the tree blossom again? In the end it is clear that such a small word can have many different meanings and such an impact on everyone’s life. Mine. Yours. Ours. Just like little gestures that can put a smile on someone’s face. Summing up, one could say that Solidarity is about giving whole-heartedly and that it is an active way of love without which we cannot live. Building trust, being united and loving unconditionally. Tasks that are easily described but difficult to put in practice. But by having trust and faith in God as the roots of the tree, holding it firm in the ground through storms and rain, nourishing the branches and leaves, everything is possible. 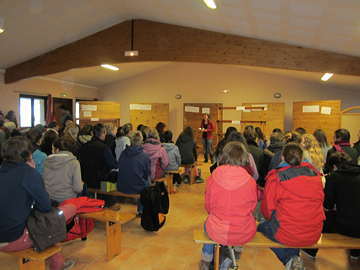 If you are planning to come to Taizé and you are interested in taking part in this group, or for more information please write to echoes taize.fr.